A Thousand Flowers: Four Tapestry Smalls Available Now! Today’s the day I get to share with you my newest e-book, A Thousand Flowers, and, for the first time, a kit to go along with it! A Thousand Flowers is an e-book. It is a PDF file that is delivered to you after purchasing, via a download link through your email. As a PDF, the e-book can be viewed on your computer or laptop, as well as on any mobile device (phone or tablet) that supports PDFs. The e-book can be printed in part (or whole), just like any document on your computer. The e-book features four charts for tapestry smalls worked in counted petit point on silk gauze. The charts are offered in three different formats. You will also find stitching and finishing tips to successfully guide you through the projects. 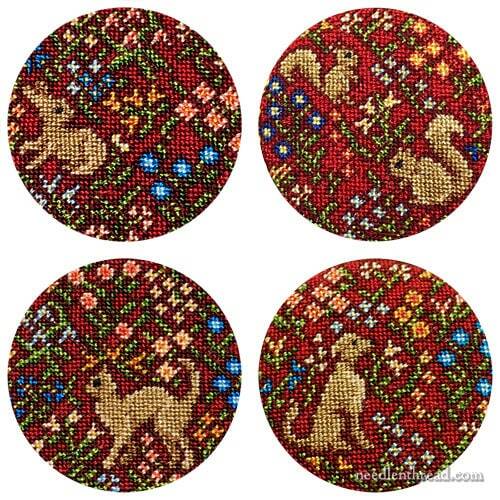 For the examples in the e-book, the tapestry smalls are stitched on 48 count silk gauze, to produce 32mm (or 1.25″) rounds that can be mounted in jewelry bezels or finished as ornaments, scissor fobs, large decorative buttons, or whatever else you can conceive! The projects in A Thousand Flowers are best suited to stitchers who have some experience with counted work and know how to follow a chart. 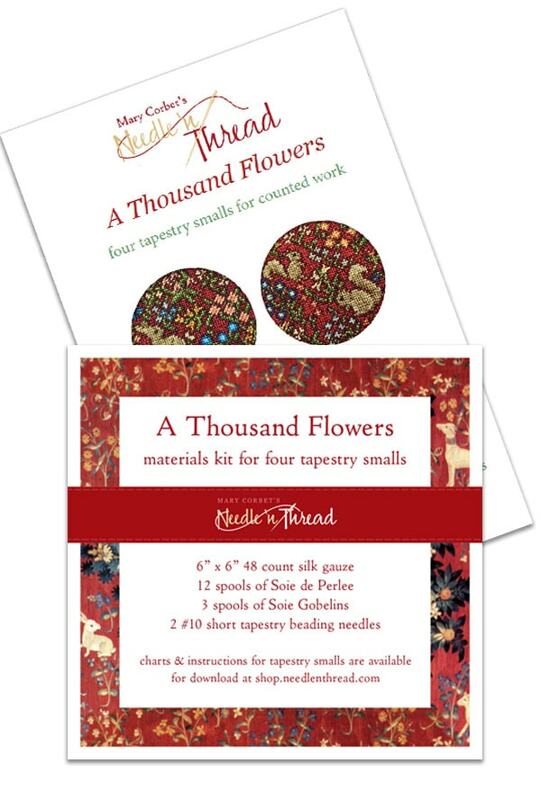 If you love counted work, if you love medieval textile history, if you love cats, dogs, squirrels and bunnies, if you love miniature work and finishing beautiful needlework into useful or decorative items – A Thousand Flowers is for you! Because 48 count silk gauze is rather fine, you will need good lighting and you might need magnification. That’s said, you can substitute other gauges of silk gauze or your favorite even-weave fabric. When I originally designed the tapestry smalls, I designed them to mount in these jewelry bezels that I wrote about a while ago. They make beautiful gifts as brooches, necklaces, or ornaments when mounted in these bezels! 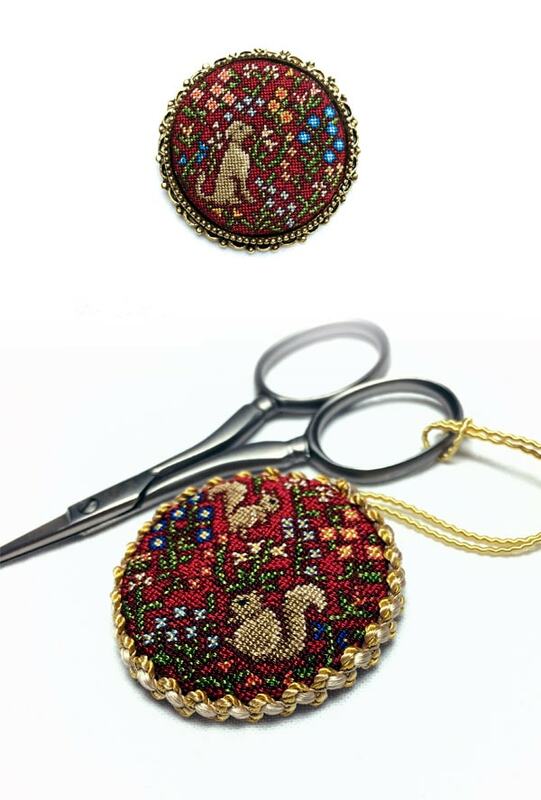 For one example, I worked the design (the squirrels in the photo above) on 40 count silk gauze and finished it as a scissor fob. The same finishing technique works if you want to hang the tapestry small as an ornament. The e-book includes instructions and tips on stitching and finishing the smalls as jewelry inserts and little ornaments, both of which processes can be adapted to other finishes as well. You’ll find a complete materials list, with information about making substitutions as well. You’ll find full-page, large charts for all four smalls, in three formats: black and white charts with symbols only, full color and symbol charts, and charts with colored symbols. This way, you can choose and print your preferred style of chart. The materials kit for A Thousand Flowers includes fabric, thread and needles necessary for stitching the four tapestry smalls. It does not include printed charts or instructions. 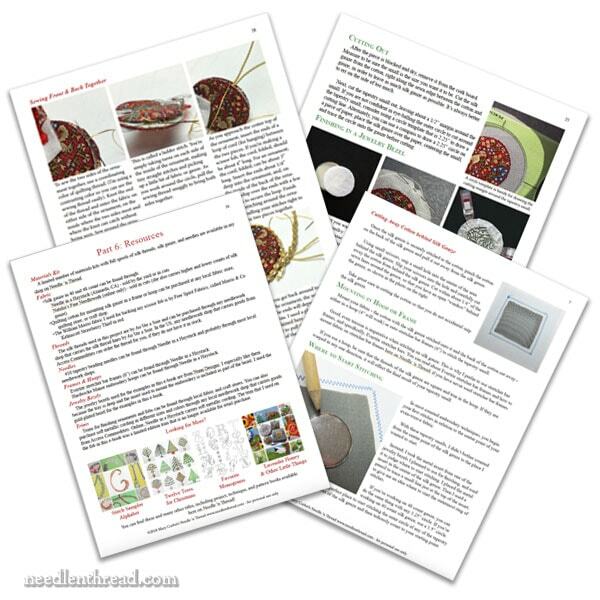 The charts & instructions are only available as a PDF download. When you purchase the kit, the PDF will be automatically delivered via email. Each kit includes 48 count silk gauze, 15 full spools of exquisite French silk, and two required needles. To keep the cost reasonable and to allow for differences in needs and individual preferences, finishing materials are not included in the kit. However, the e-book includes resources for finishing materials and tips on what to buy and where to find them. The kit provides enough silk gauze to stitch all four tapestry smalls. And, glory be! There’s enough silk thread in the kit to stitch well more than four smalls! The full spools give you the opportunity to experiment with other sizes of silk gauze or other even-weave fabric, too, if you wish, without worrying about running out of thread. 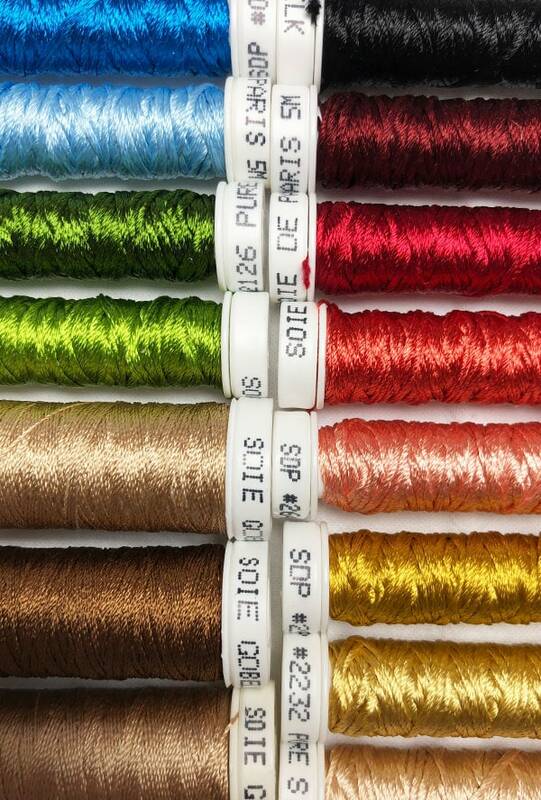 The silk is the highest quality French silk from Au Ver a Soie – 12 spools of Soie de Paris and 3 spools of Soie Gobelins. To stitch the tapestry smalls, you’ll need a hoop or stretcher bars; some scrap cotton fabric (quilting cotton, muslin, calico); scissors; and lighting and / or magnification. The materials kit for A Thousand Flowers is sold only as a bundle with the e-book, for $80 + shipping. This represents the retail cost of all the parts represented in the kit and almost a 50% discount on the cost of the e-book. You can purchase the materials kit & e-book bundle here. When purchasing, please make sure that you enter your shipping address and your email address accurately. The kits will be mailed priority flat rate in the US, and global priority flat rate otherwise. This makes the shipping expensive for international orders, but it guarantees tracking and a relatively quick delivery. I will ship internationally to Canada, the UK, Australia, and New Zealand. If you are interested in a materials kit and you live in a different country from those listed, or if you have any questions about shipping, please contact me. The e-book for A Thousand Flowers is available here. It is $15, and will be delivered to you via a download link in your email. You’ll receive a download link at the email addressed provided when you make your purchase. If you do not receive your download link within a few minutes after your purchase, please contact me. There are some email service providers that block auto-generated emails, so keep an eye on your inbox, and if you don’t receive the download link, just let me know and I’ll get it to you. You may print part or all of the e-book for your personal use. I recommend printing just the chart you plan to use, and reading the rest of the e-book on your computer or tablet. I also recommend reading through the entire e-book before you begin stitching. You’ll pick up tips and techniques throughout the e-book that will help you successfully stitch and finish with your tapestry smalls. If you have any difficulties with your e-book download, just drop me a line and I will sort them out for you! And that’s it! Pop on over to my shop if you’re keen to stitch your own Tapestry Smalls from A Thousand Flowers! I’m going to be stitching a few more in the weeks to come, so why not join me? I’ll be sharing progress and a couple other finishing ideas along the way. I hope you enjoy stitching them as much as I do! 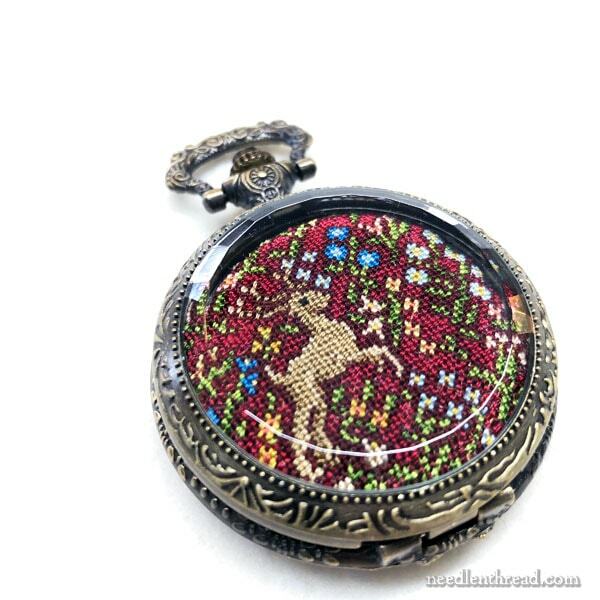 You can read about the deer design and pick up some finishing tips for the pocket watch setting in this article. 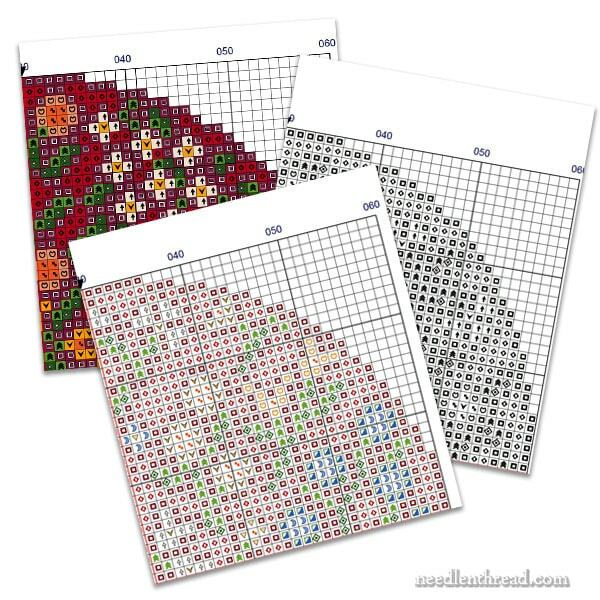 If you wish to add the deer chart to your collection, it is available here, as a separate chart from the original Thousand Flowers tapestry smalls. The deer supplement is the chart only, with no key or materials lists and no stitching or finishing tips. Those are all found in the original e-book for A Thousand Flowers: Four Tapestry Smalls. It’s sold out already! I’m so upset!!! Hi, Alessandra – I’m sorry! 🙁 I’m awaiting a backordered color of silk and as soon as it comes in, I’ll have a small collection to sell again. Also, if there is interest, I’ll most likely put together some more kits. The kits went faster than I thought they would! And that’s good news for me, but bad news for those wanting one! I’ll let everyone know when I have more in stock. Congratulations on selling out so quickly! I’m bummed – I got up early to try to get this kit because I thought it would, but yikes! Is the list of silk colors available in the pdf? Well, you were right! 30 min in and the kits were sold out. I missed it this go around. I’d like to purchase the kit next go around, but I’d like to go ahead and get the pattern now to be reading it. Will I be paying twice for the pattern if I purchase now and then later with the kit? Hi, Karen – on the next round, I’ll add two options – the stand-alone kit, and the ebook / kit bundle. 🙂 thanks for asking! Oops! Now I see your answer. I am sending this message on anyway. I am hoping I will be faster to order next time! As soon as you provided the preview earlier this week, I knew that I had to have it. The instant download of the book is great, and the directions are great. This is the first e-book that I have purchased from you (as I tend to prefer counted work), and I am already planning to go back to your site to buy more. Clear instructions, wonderful pictures and great explanations and tips. I signed in to do some work this morning, but have been diverted. Beautiful images of embroidery tend to help that diversion process! I can’t wait for the kit to arrive. I am so looking forward to these small projects. They will be my carrot projects over the next month in all the year-end craziness. Just for giggles I popped over to your shop and congratulations!!! Your kits are sold out! Hi just wondering when the thousand flower kits will be available again? 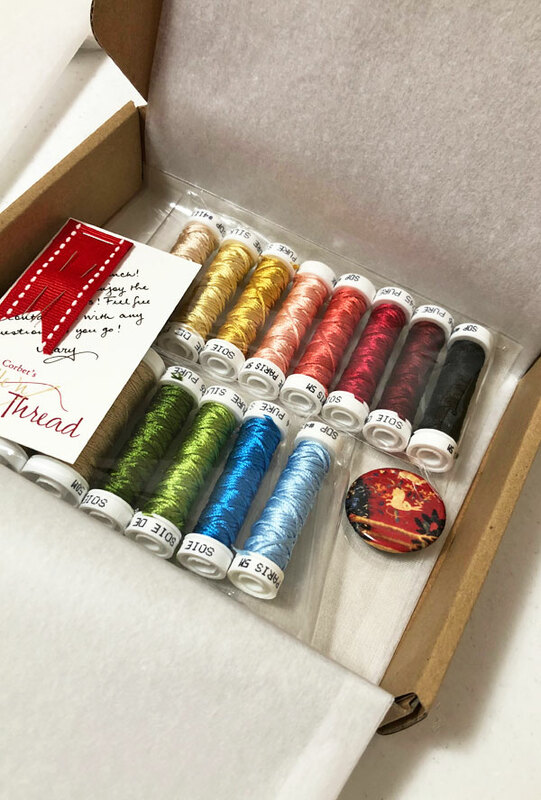 Hi, Frances – I’m awaiting one backordered color of silk, and whenever it can get from the supplier, I’ll have a small bunch of kits to release. At that point, I’ll make a decision whether or not I’ll do another kit run. It really depends on the interest and demand. I don’t know when the backordered silk will come. I’m hoping before Christmas! Is there a chance that the kit for the smalls will be available again. I am so sad that it is sold out. I purchased A Thousand Flowers last week and so far, just leafing through it, I’m going to love it. I purchased the 100th issue of Inspiration magazine based on your comments and oh my gosh it is wonderful. My favorite is the white rose brooch, I don’t think I have the talent to make it; but just looking at the picture is wonderful. I know you don’t respond to your readers, but know that I appreciate all of things that I’ve learned from you and wish you the best Christmas ever. I would like to stich these thousand flowers but would need to work at a larger scale, as I am 91 and I need to wear glasses for reading now. Examples of two or three graph sizes would be a great help for me. I guess that I would need more of all threads etc. My kit arrived today and it is even more beautiful than I expected. Thank you!! Hi Mary, have a couple of questions about the supplies for the Thousand Flowers ebook. Have the ebook and the silk gauze, but unable to purchase the kit. Would Soie d’alger be a suitable substitute for the Soie De Paris and Soie Gobelins? If so, do the colors have the same names, do you know? Hi, Beth – Soie d’Alger won’t really work as well on these – not on the 48 count, anyway. Of course, you can always try it, but it’s a softer thread because it’s spun silk, so it doesn’t hold up to the silk gauze quite as well as the other threads. The numbers, I believe, are the same across the line. Next Next post: Stitcher’s Christmas, 2018: Passion for Needlework x 5!